Macau: the bulbous nose of China, a peninsula and two islands strung together like a three-bead necklace. It was time to find a life for myself. To make something out of nothing. The end of hope and the beginning of it too. After moving with her husband to the tiny, bustling island of Macau, Grace Miller finds herself a stranger in a foreign land—a lone redhead towering above the crowd on the busy Chinese streets. As she is forced to confront the devastating news of her infertility, Grace’s marriage is fraying and her dreams of family have been shattered. She resolves to do something bold, something her impetuous mother would do, and she turns to what she loves: baking and the pleasure of afternoon tea. A delicious, melt-in-your-mouth novel featuring the sweet pleasures of French pastries and the exotic scents and sights of China, The Color of Tea is a scrumptious story of love, friendship and renewal. I have never tried a macaron, but now I must try one after reading this book, if I can be lucky enough to find this delicate French pastry! Yes, France is where Grace first falls in love with the macaron, not to be confused with a chewy, coconut macaroon, as the two are completely different. I had to look up the two as I was a little confused about a macaroon and a macaron, plus I had to find the pronunciation, as I was and curious, too, to see if they were two separate pastries! The confectionery is characterised by its smooth, squared top, ruffled circumference (referred to as the "foot"), and flat base. It is mildly moist and easily melts in the mouth. The fillings cana range from jams to ganache to butter. Since the English word macaroon (notice the double O's) can also refer to the coconut macaroon, many have adopted the French spelling of macaron to distinguish the two items in the English language. However, this has caused confusion over the correct spelling. Some recipes exclude the use of macaroon to refer to this French confection while others think that they are synonymous. You'll notice "I" underlined and noted above the double o's for macaroon. The macaron is not spelled incorrectly, but is completely different from the macaroon here in America. The macaron is entirely French. The photos on the front of the book look exactly as the one did at Wikipedia for the French pastry. With that explained, and so no one mixes up the macaron in this book with the American macaroon, onto the review! It took me forever to read this book. Months. It was not a book that grabbed me and drew me into 'wanting or needing to read it.' For myself, it was not a 'must read' book. It was enjoyable, but I did not feel the book pull me in where I had to read this story. Had I not felt as if I had to read it, I probably would have put it down. The beginning of the book was very slow and depressing, but I believe it was written this way intentionally, to show the depression that Grace was suffering through over the reality that she would never be able to bear children. This debut author very much succeeded in what she was trying to do. I also have a personality differences between myself and the main character, which made it harder for me to relate to this delicate, sad, soft spoken character. I prefer a stronger character than Grace was, but I continued on, and happily, the character does becomes that stronger character in her own way. Grace decides she would like to open a cafe in Macau making macarons, a delicate French pastry. She meets with a man, Leon, whom she knows from living in Paris. Leon loves Grace, and Grace finds herself liking him very much as well, but she realizes it's more for the love of the macaron and she has to put a distance between them. She learns alongside him the intricacies of baking the macarons and getting them just right. There is a talent to making these just right. She perfects it and opens the cafe, calling it Lillian's, after her own mother. Once she opened Lillian's, her French cafe serving tea and macarons in China, the shop becomes bustling with customers and energy. Grace becomes a completely different person. She becomes much stronger, more confident of herself, much happier, able to be a boss and direct people to do things and more. She realizes she is happy. For the first time she is truly happy, all thanks to Lillian's. Lillian's made her face any fears and loss she had in life making her become whole. I have to mention this author's style of writing. It is very beautiful. It is prose, thought and then very descriptive, all mixed together in the way Grace talks about her life, her husband, her friends Gigi and Rilla, writes letters to her mother and even the way the author names the chapters of the book, such as The' Pour Deux - Tea for Two/Pink Earl Grey Infused with Dark Chocolate Ganache. Every chapter is titled in this way. In some ways her writing is almost poetic at times in the way she describes many things, from the Chinese New Year, down to the french macaron and the way it is crisp at first, softens as it melts in your mouth and then the flavor explodes to life in your mouth at the exact time it's supposed to as a macaron should. She also writes like this about the places she has lived, Macau, the people of Macau, and and in the apologetic letters written to her mother as Grace feels somewhat guilty for the way she left her mother, the way she did it, the words she used when she was younger, and in a beautiful way, asks for her forgiveness in these letters. It is very special as you read this, as you can also see Grace's growth as a person as she writes the letters, never fully coming out and telling her mother what has happened, but describing them in a different perspective. These letters were healing for Grace. Grace is devastated by something that happens in her marriage, and finds she must climb out of this, too. She puts some of the blame of it on herself, where I had a hard time with that. Grace's character is a very forgiving character, and when it comes to a vow being broken in marriage the way it was, I am not as forgiving a person as Grace is regarding it, and she even puts some of the blame on herself as to what happened, where I would have played it over and over in my mind and not blamed myself. The character really did struggle to overcome this and forgive him, but I could not have forgiven and gotten over it the way she did and I might even have left the marriage because of it. Overall, in the end she found herself a completely different person than the person she was when she arrived in Macau. She was a better person for herself, her close friends she made, and her husband. The ending was beautiful, but predictable. I was disappointed with that. It was almost a fairy tale ending you could see coming to easily. Overall, this book was a very delicate book just like tea and macarons, but strong in taste as tea can be, and just as macarons are supposed melt slowly and burst into it's flavor on your tongue. If you love tea and delicate pastries, this book will be very much appreciated if you can get past a few of these things I mention. 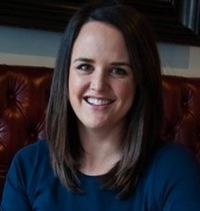 Hannah Tunnicliffe was born in New Zeland but is a self-confessed nomad. After finishing a degree in social sciences, she lived in Australia, England, and Macau. A career in human resources temporarily put her dream of becoming a writer on the backburner. She currently lives in New Zealand with her husband, Matthew, and their daughter, Wren. 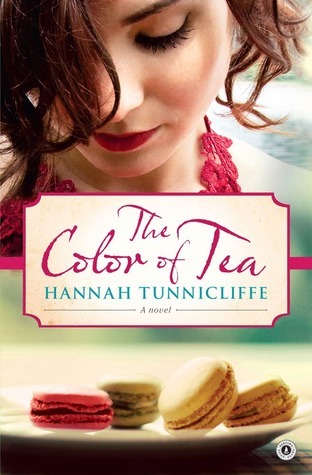 The Color of Tea is her first novel.